Alfred and Donna LaRochelle's small organic farm is about eight miles north of Gravelbourg and they both work full time with jobs in town. Though the farm is small it brings in excellent revenue because it grows organic crops, which are in high demand and the costs of the operation are very modest. When looking at a farm operation like this, one realises that small is what all farms were once like, and small also means profittable, which is something that large mechanised farms are not, due to the very high input costs and the uncontrollable rise in costs like fertilizer and fuel. A small operation can make do with easy to operate equipment and capitalise on family pitching in with the big tasks like looking after the hay crop and harvest. This past weekend, it was time to bring in this year's excellent hay crop for the few cows and horses that are part of the farm. Unlike large farms, which put up hay in one tonne bales that need special equipment to handle, the LaRochelle farm uses an older square baler to process the hay and these small bales can be handled manually. Years ago, this was the only way to handle hay and farmers used horse drawn hay wagons to pick up the product from the field, or later, tractor pulled trailers, but the work of handling and stacking the bales was still hand work. 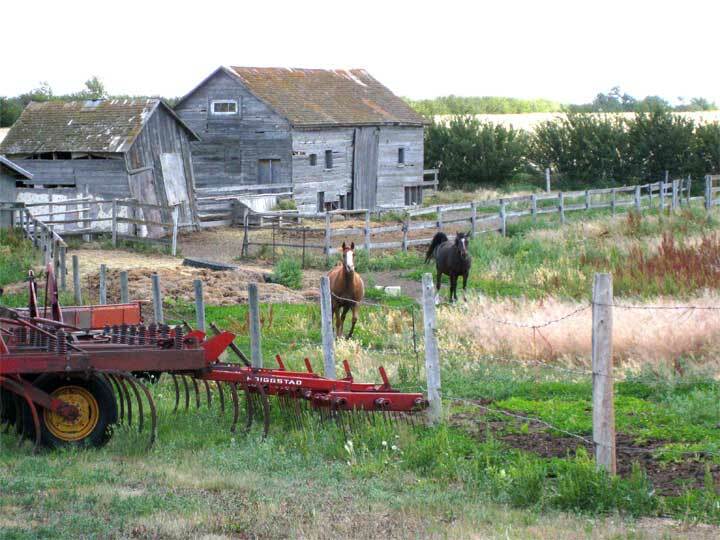 I remember one summer as a thirteen year old, going from farm to farm with a couple of friends, picking up hay. Dawn's pictures pretty much tell the story of the family pitching in using their pickups to haul the bales in from the field then using a conveyor to move them up into the loft for dry storage.